It's a hot summer day and this little girl wants to eat some refreshing ice cream. Her mommy will take her to the park and spend the day in the sun with her. 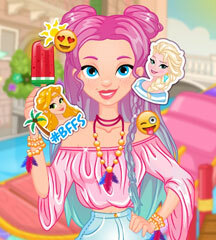 Join the beautiful lady and her adorable daughter in one of the most stylish summer dress up games! The young girl can't wait to learn some fashion tips, so she will look fabulous like her mommy. You should teach her a few tricks and plan her outfit for the day! You can choose matching clothes and accessories for the two girls. Just make sure they look gorgeous!